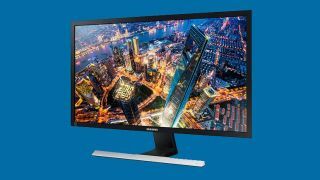 Samsung unveiled two UHD resolution desktop monitors targeting gamers and multitaskers. The U28E590D ($599, £378, AU$775) comes with a 28-inch panel while the E24E590D ($399, £252, AU$516) comes with a more compact 24-inch screen. Both monitors sport a resolution of 3,840 x 2,160 pixels and come with AMD's FreeSync technology, which improves the refresh rates and picture quality for gaming and entertainment. Because the 28-inch model comes with a twisted nematics (TN) panel, it has a faster gray-to-gray refresh rate of 1ms. The PLS, which is similar to IPS screen technology, panel of the 24-inch model has a slower 4ms gray-to-gray refresh rate. Another big difference between the two underlying technologies is the viewing angle, with PLS offering a wider 178-degree view horizontally and vertically, while the TN has more limited 170-degree and 160-degree viewing angles, respectively. Even if you plan on buying these displays for gaming, you can still use them to keep productive at work. The monitor comes with Picture-in-Picture technology, Picture-by-Picture to connect two different PCs to the same monitor and support for both DisplayPort and HDMI ports for video input. Samsung is also promoting the UHD 4K resolution of the two panels as a benefit to reducing eye strain. The display is also marketed as flicker-free, which should help further reduce eye strain even at lower brightness levels. For gamers, using a PC or notebook that supports AMD FreeSync technology with these two displays means that you'll get a more responsive screen, resulting in the "elimination of screen tearing and shuttering," according to Samsung. This will be especially true of the larger panel, which has a fast 1ms response rate. For high-frame rate games, this is an important feature as it reduces or eliminates ghosting. Both displays come with a 60Hz refresh rate for smooth performance. The 24-inch will become available on July 26. Users interested in the 28-inch U28E590D can pick one up now.